Anyway – it’s been a great week of racing in Australia. Huge crowds, five different stages winners, the Ochre leader’s jersey swapping shoulders regularly and now a gap of just one second between first and second place going into the last day tomorrow. Aussies have been much to the fore as you would expect in their home race. Gerrans, Evans and Porte have taken the stage wins in turn through the week and it’s the Orica-Greenedge and BMC men who are split by that tiny gap at the top of the podium places. Evans seemed to be looking right back on form with a swashbuckling win on Stage 3 and looked to have done enough on Stage 5 to hold the jersey into the final day. However he faded in the critical last few metres on the second ascent of Old Willunga Hill and let Gerrans sneak in front for the decisive bonus seconds. Porte took the stage win in impressive style – and even managed to get both hands off the handlebars to celebrate: something he notably failed to manage when crossing the finish line on the Champs Elysee last July. Sprint wins for Kittel (in the pre-race crit) and Greipel have kick-started their seasons well and provided a well balanced week of racing. 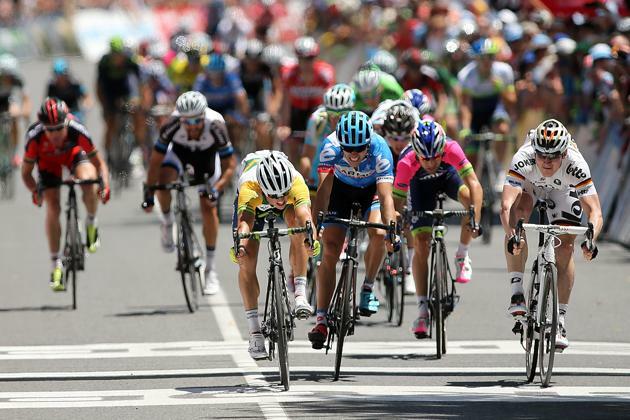 Jersey Pocket favourite Adam Hansen has held the King of The Mountains jersey all week. However his lead has been also been chipped away at and he heads into the last day equal on points with Axel Domont of AG2R. Trek’s Jens Voight – racing as Number 42 to match his age – has lit up a number of breakaways and Jans Bakelants has also been at the front a number of times. Conspiciously absent from any traceable mention have been Frank Schleck on his return to competition and the entire squads from Tinkoff Saxo, FDJ, Movistar and Belkin; all of whom have seemingly gone the whole week without raising their heads.. Early days in the season though. Over in Argentina Movistar have been doing a rather more high profile job. 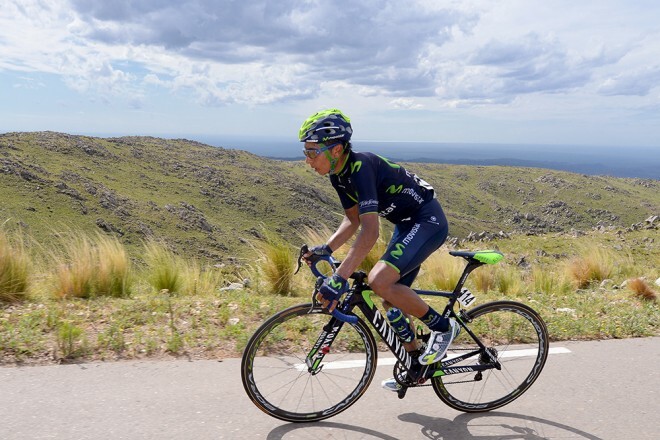 Nairo Quintana has stone-facedly battled his way to the top of the GC pile after 5 stages. He did the damage on the mountain top finish of stage 4 by putting almost a minute into the second place man on the stage but then took the leader’s jersey after a relatively strong 16th in the individual time trial on stage 5. With half a minute over Philip Gaimon of Garmin and another high mountain finish to come before the final stage, it looks like the Colombian will be the first of the Grand Tour contenders to get an overall victory this season. Nibali is way down in 45th place at the moment – some 17 minutes off Quintana’s pace but is on a different season plan. Quintana has already discounted an appearance at the Tour this year and may do the Giro and Vuelta instead. GB’s youngster Adam Yates, riding for Orica-Greenedge this season, is in a creditable 13th so far in Argentina. This entry was posted in Pro cycling, Uncategorized and tagged cadel, Cycling, nibali, porte, procycling, quintana, san luis, tour down under. Bookmark the permalink.